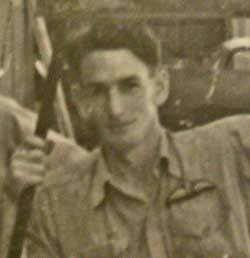 Mervyn Holly Durham Gillman was born in York, Western Australia on the 19th December 1919. He was the son of Frederick Richard Hoops (1885-1977) and Emilie (later spelt Emily) Opal Durham (c1895-1975). Frederick Richard Hoops was a great grandson of Peter Broun, the state's first Colonial Secretary. Peter Nicholas Broun (1797-1846) arrived in WA in June 1829 on the "Parmelia" with Captain Stirling. When Mervyn's mother married Charles Denne Gillman (1887-1963) his surname changed. His step-father was a chaplain in WW2. He was educated at Warwick State School (Queensland) and later the Church of England Grammar School (Churchie) in Brisbane from April 1936 until the end of 1937. He represented the school in both tennis and cricket. A member of the school cadet unit 1936-1937 where he attained the rank of sergeant and was in charge of the 3rd Platoon in 1937. In 1936 was the Runner Up - High Jump event in the school athletics championships. In the following year he was 3rd in the 880 yards race in the championships. Mervyn was a student at the University of Queensland from 1938 until he enrolled in the armed forces. He married Isabel Jean Taubman Blackwell on 13 May 1942. Enlisted in the army in 1939 (9/49 Battalion) before transferring to the RAAF in August 1940. In 1942 (while a sergeant) designed and built an anti-aircraft gun mount with periscopic sighting and remote control ("the Gillman Gun Mounting"). The design provided protection for the gunner. After consideration by both the air force and the army the mounting was not put into production. He embarked from Sydney for the UK in May 1942. In May 1943 he was commissioned as a Pilot Officer and posted to 12 Squadron at RAF Wickenby, UK. The members of the crew were the navigator, pilot officer H.W. (Bert) Pearson DFC; bomb aimer, Seargant Roy William Bell; wireless operator Seargent J George Anderson; flight engineer Seargent Leonard William Smith (Smithy); mid upper gunner, Flight Seargant William (Billy) Ross Wicks, DFM (RAAF), killed in action 27th September 1943, age 21; and the rear gunner, Seargent Andrew Stanley (Stan) Miller, DFM (RNZAF). Note: Billy Wicks grew up in the Inverell district in the New England Tablelands in New South Wales. He is buried in Cambridge City Cemetery. A bomber pilot's first significant flight was known as a "nickel" and did not inolve the dropping of live bombs. Usually paper in the form of propaganda leaflets was dropped instead. Mervyn Gillman's nickel flight probably originated from Seighford. Later Roy Bell's wife, Ellen, was to recall Mervyn as a charming and attractive man, very sociable, and full of life. As the "skipper", he spent a good deal of his time away from his crew with other pilots. Roy Bell described Mervyn as a "a bloody good pilot" and his daughter said "It was his [Mervyn's] skill that ensured dad survived the war". "Pilot Officer Gillman is an exceptionally able captain of aircraft who has consistently completed successful sorties during his operational tour. On a recent raid on Hamburg he displayed outstanding determination to reach and bomb the target. He was compelled to fly through very adverse weather on the outward journey and after reaching the objective he searched for twenty minutes before establishing the target and releasing his bombs. This officer's skilful handling of aircraft and splendid record of achievement have been an example to all in the squadron"
At the end of October he was posted to 1668 Conversion Unit where he may have trained on the Halifax and was then promoted to Flying Officer in November. Whilst with this unit he received the Ribbon of the 1939-1943 Star. For some of this time it seems he was on a course with No 3 F.I.S. [? Flight Instructor School, perhaps at Ludford Magna]. His final posting (December 1943) was to No 11 Base at Lindholme. Mervyn Durham Gillman was killed in a flying accident, travelling from Ludford Magna to Seighford in an Oxford Mach 1 to attend the wedding of a member of his crew, Roy William Bell. Roy and his wife Ellen were married the next day but were not told of Mervyn's death until after the wedding. At 6pm on the 16th January 1944, the wing of his aircraft hit a tree two miles west of Church Lawford (about 8 miles southeast of Coventry) after failed attempts to land in thick fog (visability 100 yards) at both RAF Church Lawford and RAF Honiley. He was buried at the Oxford (Botley) Cemetery (Plot I/2 Grave 140) with full service honours. His name appears in the Commemorative Area (panel 122) of the Australian War Memorial, University of Queensland Roll of Honour board and the Anglican Church Grammar School Roll of Honour. The types of aircraft he flew were DH 82, Avro Anson, Oxford, Wellington, Halifax and Lancaster. It was noted that type of aircraft he was most proficient at flying was the Lancaster. His DFC was presented to his wife, Isabel, by the then Governor-General (Henry, Duke of Gloucester) at Government House Sydney on the 16th February 1946. David Park, former student of Anglican Grammar School, Brisbane. Olwen Johnson, relative of Roy Bell. Any information on this relative of John's welcomed. Please contact John if you have any information about him.